Sisters collaborate to contribute leadership, funding and outreach to ease the way for people experiencing homelessness and create long-term housing solutions in the Northwest. Following in the footsteps of foundress Blessed Emilie Gamelin, the Sisters of Providence have for 175 years reached out to people experiencing homelessness as part of their call to respond to those who are poor and vulnerable. From the earliest days, even before she took her vows, Emilie Tavernier-Gamelin knew the value of collaboration to increase the impact of her service to the community. She enlisted a group of compassionate, socially-minded women to help minister to their poor and vulnerable neighbors in Montreal. Mother Joseph employed a similar strategy when she arrived in the Washington Territory in 1856 and began building an infrastructure of health care, education and social services. Because of the vast territory that needed attention and a smaller congregation than those typically found in the Midwest and East, collaboration with other religious communities and lay people in the West proved a practical approach for stretching resources to support those in need. Over the years, the Sisters of Providence in Mother Joseph Province (MJP) have responded to changing times with the same collaborative spirit as their foundresses to make a more significant impact in the community. 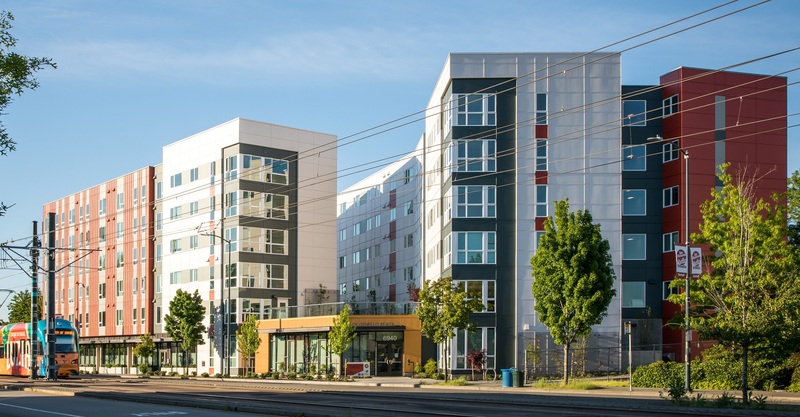 Mercy Housing Northwest’s newest completed development, Mercy Othello Plaza, features 108 affordable apartments, mostly 2 and 3 bedrooms—a rare commodity in Seattle. Mercy grew out of an intercommunity collaboration including Sisters of Providence. Mercy Housing Northwest (MHNW) provides safe, affordable homes to people with low incomes, including families, seniors, people who have experienced homelessness and people with disabilities. With rents well below market rates, MHNW aims to prevent residents from falling into homelessness. More than 12,000 people experienced homelessness in King County last year. MHNW was created in 1981 when five religious communities came together to fill a need for affordable housing in the Seattle area. 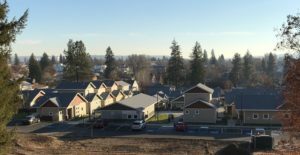 Originally called Intercommunity Housing, the organization was founded by Sisters of Providence, Sisters of St. Joseph of Peace, the Adrian and Tacoma Dominicans, and Sisters of the Holy Names of Jesus and Mary. Representatives from each of the religious communities serve on the board of directors. Provincial Councilor Jo Ann Showalter, SP, represents both the Sisters of Providence and the Tacoma Dominicans with whom the Sisters of Providence have a covenant relationship. With 41 properties in Washington and Idaho, MHNW serves more than 5,000 people every day. Construction is underway on two new facilities, and another is in the planning stages. Between them, they will bring to Seattle 400 much-needed family apartments along with programs that help residents build stable lives. Sponsored in part by Sisters of Providence, Transitions’ new Home Yard Cottages provide permanent, affordable housing to 24 low-income families in Spokane, Wash.
Transitions in Spokane, Wash., has been lifting women and children out of poverty since 1995, when the Sisters of Providence, Sisters of the Holy Names of Jesus and Mary, Sinsinawa Dominicans, and Sisters of St. Francis of Philadelphia collaborated to bring together several housing and support services under one organization to more effectively serve the community. Every day in Spokane, about 1300 people are experiencing homelessness. To help address this, Transitions recently opened the Home Yard Cottages—24 small single-family homes providing a permanent, affordable housing option for families and individuals with a low income, who have disabilities or were previously homeless. “Transitions and the sisters who brought us here had a sense that no one should get left behind, that a community is everyone,” said Ami Manning, director of housing services at Transitions. The development was built on land adjacent to the nonprofit’s headquarters. Cottages range from 500-square-foot studios to 1,000-square-foot, 3-bedroom houses furnished with beds, dressers, table and chairs, and household basics. Keeping environmental impact in mind, 15 of the homes were built with solar panels and all of them with other energy-saving measures. In addition to housing, occupants have access to supportive services through case managers, a community building with tech center and laundry, and a future playground and garden. Other Transitions programs include Women’s Hearth, Transitional Living Center, EduCare, Miryam’s House and New Leaf Bakery Café. Sister Judith Desmarais, provincial superior, participates on the board of members—a group made up of representatives from each of the founding religious communities—and Sister Annette Seubert is active on the board of directors. Jubilee Women’s Center in Seattle offers a transitional residential program for single women moving out of homelessness. The two-year program gives women the time and support to stabilize, heal from trauma, and make positive life changes so they can reclaim their independence. 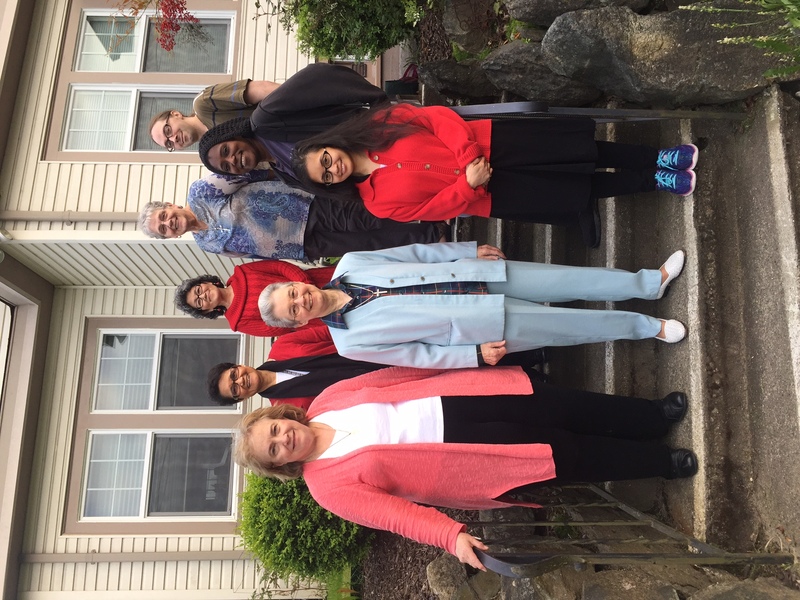 Members of the Mother Joseph Province leadership team with residents from Jubilee Women’s Center at Sojourner Place in Seattle (2017). The Sisters of Providence transferred operations of their Sojourner Place transitional housing ministry to Jubilee in 2014. Sister Judith Desmarais, provincial superior, and Jennifer Hall, provincial treasurer, serve on Jubilee’s board of directors. Jubilee empowers about 60 women a year with affordable community housing, holistic support services, and a focus on employment preparation to advance each woman on her path out of poverty. Jubilee also serves nearly 2,000 low-income women with free referrals, job and life skills classes, clothing boutique and computer lab. In early 2019, Jubilee will open Martha’s House with room for 12 additional women. 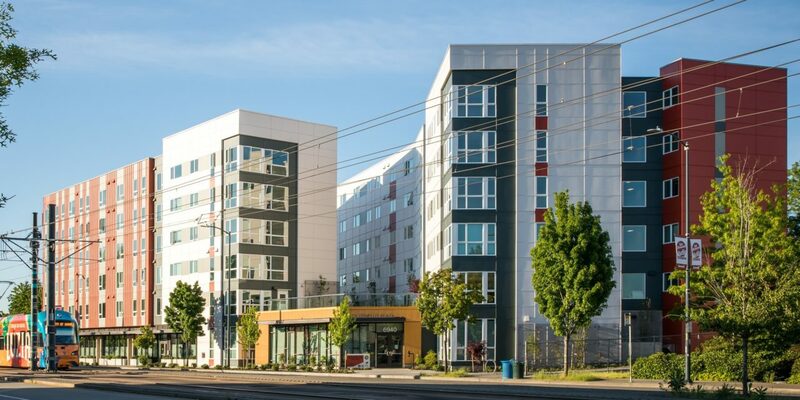 Located just a few blocks north of Jubilee’s main site in Capitol Hill, the new home will meet a need for those Jubilee program graduates who would benefit from extra time to strengthen their financial position before making the leap into market rate housing. 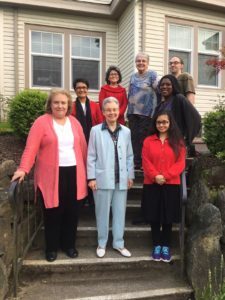 Several Sisters of Providence pursue individual ministries with people experiencing homelessness, working in partnership with human services organizations in their communities. 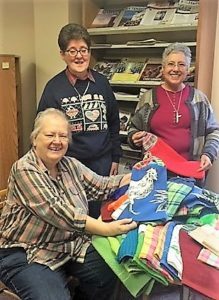 Sisters Eleanor Goligoski, Liz Cole and Myrta Iturriaga with a gift of kitchen towels for the residents of Buder Haven, a low-income apartment complex in Spokane. Myrta Iturriaga, SP, is one such sister. She assists a social worker at the Catholic Charities of Eastern Washington’s House of Charity (HOC) in Spokane, Wash. The HOC provides emergency services, including meals, shelter and case management, to an underserved population of men and women while preserving the dignity of each person. Most of the people Sister Myrta works with are estranged from their families, struggling with addictions and dealing with mental illness. Sister Myrta said it can be challenging, especially during the winter months when more people need services. But she enjoys helping clients build confidence and a sense of community, attending to everything from collecting food to raising spirits with birthday celebrations and bingo. “My work is listening and giving the opportunity to help if we can do it, with warm and loving acceptance just us they are,” said Sister Myrta.